As we embark on the festive season, I would like to take this opportunity to remind you of the importance of renewing your firm’s membership in the Association for the upcoming year, 2019. This past year has been a very memorable one for the HKVCA, with marked growth in our membership numbers as well as a substantial increase in the number of activities and events that the Association has held. Growth has been notable too in terms of the number of participants who attended HKVCA activities, especially our three major annual flagship events – the Asia Private Equity Forum, China Private Equity Summit and the Hong Kong Venture Capital Forum – which have each come to be regarded as among the leading professional conferences in the region. It is through these and other such events that the HKVCA continues to reach-out to all sectors, not only of our profession, but to those other industry professionals who share a common interest in ensuring the continued financial stability and success of Hong Kong and Greater China. As we look forward to 2019, the HKVCA remains committed to providing our members with access to a full range and calendar of events, from large international conferences to smaller industry-relevant seminars. We will continue to offer – and indeed will be expanding – our formalized training programs, as well as the number of social events where our members can take full advantage of opportunities for networking with industry peers, government representatives and professional colleagues from other industry associations across the globe. We sincerely appreciate your continued participation and involvement in the HKVCA and are pleased to be able to offer our members a special incentive for early renewal of their membership. Renewal letters, with accompanying invoices, have already been sent to all members and, accordingly, we invite you to promptly renew your membership, thereby ensuring the essential support that is needed for the work of our Association. If you have any questions or enquiries, please do not hesitate to contact Joanne Yuen or Shire Xie at sxie@hkvca.com.hk. We look forward to seeing you at the Association’s events in the coming year. This year’s Private Equity Fundamentals Course, our training program focused on the core fundamentals of private equity and venture capital, was held with the support of the Hong Kong Exchanges and Clearing Limited, Hong Kong University’s MBA program, and the MBA program at the Hong Kong University of Science and Technology. The first two sessions, dealing with early stage investment and private equity basics, were completed on September 3rd. Modules covering investment decisions, valuation issues and ESG, post investment matters and transaction documentation were completed on September 10th and 11th, and October 9 and15th respectively. A tax and fundraising module, which was sponsored by KPMG, was completed on the 10th of October. The final module, a session dedicated to examining case studies, was held on October 23rd. The HKVCA was very pleased that more than 90 delegates attended the course and we would like to extend a very special thanks to our hard working and incredibly knowledgeable course instructors. • What has happened under the Trump administration? 。Who are the decision makers? Please contact Kamy Chan (kamy@hkvca.com.hk) for more information. How does the new biotech chapter benefit PEVC investors? Is there anything Hong Kong needs to optimize if it is to cater to biotech issuers? This very special event offers an excellent opportunity for networking with fellow professionals and for celebrating the holiday festivities with both colleagues and friends. We are also honored to have our Executive Director, Wendy Zhu of AlpInvest Partners, joining us for the evening. China’s new individual income tax (IIT) law comes into effect on January 1, 2019. As a large number of Hong Kong-based private equity and venture capital practitioners spend time in the mainland, the new law may have a significant impact on tax liability and trigger issues related to double taxation. In particular, the law introduces a new definition of “resident” and “non-resident”, and those who are found to have resided in the mainland for 183 or more days within a calendar year will be treated as China tax residents subject to IIT on their worldwide income. Join us for a special HKVCA luncheon talk where tax partners from EY will discuss the implications of the new tax law as well offer practical solutions for Hong Kong professionals. More than 450 industry experts have spoken at APEF over the past eight years. View here. We have a limited number of free passes for pension funds, fund of funds, endowments, foundations, family offices, DFIs and sovereign wealth funds (subject to verification and a maximum of one pass per company). If you would like to apply, please email apef@hkvca.com.hk. View HKVCA Annual Golf Day 2018 Highlights here. China Great Bay Area Fund Management Co., Limited (formerly named "China Merchants Capital Management (International) Co., Ltd.") is a wholly-owned subsidiary of China Merchants Group and is engaged in alternative investment and asset management. To promote growth of the Group’s industry, finance, and asset management business, in 2012 the China Merchants Group integrated its direct investment and fund businesses, and established the Great Bay Area Fund Management. JD Capital is one of the leading private equity firms in China with over $5 billion in assets under management. Founded in 2007, JD Capital has invested in over 300 growth opportunities in Chinese mid-market companies, and has created long-term value for investors, businesses and the communities in which we work. With the first proprietary deal sourcing network across China, JD Capital has successfully implemented a buy and build strategy by partnering with industry leaders and applying our insights gained in the Chinese market. Founded in 2015, Lamivoie Capital Partners is a multi-family office headquartered in Hong Kong. Through its family partners’ well-established and global network, Lamivoie has unique access to potential investment opportunities in tech start-ups. Pacific Century Group (PCG) is an Asia-based private investment group established in 1993 with interests across three core business pillars - technology, media and telecommunications (TMT), financial services and property. PCG has demonstrated a strong track record of successful investing, and has created a long-term sustainable network in Asia and across its core business pillars. Value Partners is one of Asia’s largest independent asset management firms that seeks to offer world-class investment services and products. Assets under management of the firm was US$17.2 billion as of June 30, 2018. Since its establishment in 1993, the firm has been a dedicated value investor in Asia. In November 2007, Value Partners Group became the first asset management firm listed on the Main Board of the Hong Kong Stock Exchange (Stock code: 806 HK). In addition to its Hong Kong headquarters, the firm operates in Beijing, Shanghai, Shenzhen, Singapore and London. Value Partners’ investment strategies cover equities, fixed income, quantitative investment solutions, SMART investment strategy, multi-asset and alternatives for institutional and individual clients in Asia Pacific, Europe and the United States. CSC’s Global Financial Management provides a comprehensive range of services, including outsourced fund administration, capital markets services, SPV management and administrative services, and agency services. We provide independent and conflict-free corporate trust services through our wholly owned subsidiary, Delaware Trust Company. Through our expertise and personal approach, we’re able to offer customized services from pre-closing through to completion of a transaction, and have decades of experience in private equity, real estate, structured finance, restructuring, and across a full range of asset classes. The annual HKVCA wine tasting event, hosted by Marcus Thompson, was successfully held on November 19, 2018 at the Hong Kong Club. The theme of the evening was an examination of the old saying “let China sleep, for when she wakes she will shake the world” and whether this applies in the context of Chinese wines. Master of Wine Jeannie Cho Lee led the attendees through the tasting of three pairs of wines, one of each pair being a Chinese wine and the other a non-Chinese wine. The tastings were blind, so participants did not know which wines they were examining. Participants thoroughly enjoyed the evening and the feedback received about the event was very positive. Our thanks to the HKVCA’s Wine Committee - Marcus Thompson, Mounir Guen, Alain Fontaine and Anthony Chan – for their time and effort and for being part of another very successful evening. We would also like to thank our generous sponsor, Alvarez & Marsal, whose support made this year’s event possible. HKVCA Luncheon Talk - On-Prem, Private Cloud, Hybrid Cloud, Public Cloud: Which is the Right Setup for Your Firm? The HKVCA hosted a luncheon seminar on November 12, 2018 at the China Club. As many as 30 participants were in attendance to hear Dean Hill, Executive Director, and Michael Steinkuhl, Associate Director, at Castle Integration, provide an overview of the on-prem infrastructure. Discussion was also had on the different cloud models that are available, and the speakers shared examples highlighting the security issues that users face. We would like to thank all the participants, and especially our sponsor, Eze Castel Integration, for their generous support. On November 1, 2018, HKVCA Chairman Chin Chou led a group of 20 HKVCA members and guests traveling to Tokyo to participate in the HKTDC’s “Think Global, Think Hong Kong” mega promotion campaign. The campaign, which the HKVCA officially supports, is aimed at encouraging more overseas companies to use Hong Kong’s service platform as a way to access the mainland and global markets. The Tokyo event was attended by more than 3,000 business professionals and government officials. The HKVCA Young Professionals Committee held a mixer on October 25, 2018 at the Liberty Exchange Kitchen & Bar in Central. This special event, which has always provided attendees with valuable networking opportunities in a fun and social setting, is aimed specifically at our younger members. This year more than 75 people attended representing a broad range of sectors from within the private equity and venture capital industries. The HKVCA would like to extend its most sincere appreciation to the sponsors, Ernst & Young and Shearman & Sterling, and to all participants who together made the evening one for the ages. The HKVCA hosted its latest brownbag luncheon talk on October 25, 2018. Held at the offices of DLA Piper, as many as 40 participants were in attendance for a talk that covered the applicability and key changes to the Hong Kong Fund Manager Code of Conduct (FMCC) as well as issues around the role of fund managers. We would like to thank speaker Luke Gannon, and extend a special thanks for the generous support of event sponsor, DLA Piper Hong Kong. 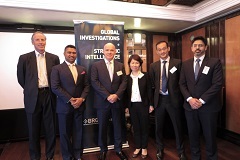 The HKVCA hosted a luncheon seminar titled “Polishing the Crystal Ball: Demystifying the Complex Business Ecosystem in India”, which was held on October 11th, 2018 at the China Club. Abhijit Yadav, a principal from Berkeley Research Group, delivered a briefing on the latest economic outlook for India and on the country’s latest policy and regulatory changes. He also forecast that the healthcare, energy and retail sectors would be strongest in the years ahead. While India continued to face a number of challenges, he offered tips on how to avoid common pitfalls when engaged in transactions on the ground. With close to 50 HKVCA members attending the event, we would like to thank all the participants, and especially our sponsor, Berkeley Research Group, for their generous support. (Press Release) - Now in our second decade of championing stewardship through ESG engagement and corporate responsibility, Pantheon is delighted to showcase our new interactive insights into these important areas of our daily life. (Press Release) - Basil Partners announced today the closing of their third fund, which has been formed through a complex restructuring and secondary acquisition of a portfolio of seasoned digital services companies. © 2018 HKVCA. All Rights Reserved.